Please type your desired tags, e.g. Theoretical, Physical or Analytical, Immunology, Medicinal, Systems Engineering, Chronic Pain, Cancer Genomics, HiC, Software Engineering, Ethics, renewable energy, water power, 3d printing, Literary Theory, Trope of monstrosity in literature and film, Deconstruction, and etc. The origin/cause of the acceleration of the expansion of the Universe: Cosmological Constant, Dark Energy, Extensions to General Relativity. Journal Paper voted by the Editorial Board of Classical and Quantum Gravity Journal as one of the journal's highlights of 2002. Article title: Interactive Geometric Database, Including Exact Solutions of Einstein's Field Equations, Mustapha Ishak and Kayll Lake, Classical and Quantum Gravity 19, 505 (2002). Journal paper selected by Chief Editor Gerardus 't Hooft (Nobel Laureate in Physics 1999) to appear in the highlights of 2008 of the Foundation of Physics Journal. Article title: Remarks on the formulation of the cosmological constant/dark energy questions. Mustapha Ishak. Foundation of physics Journal, 37:1470-1498,2007. Journal paper highlighted at Physical Review Letters as Editors' suggestion and selected for a synopsis in Spotlighting Exceptional Research in Physics (2013) website of the American Physical Society. "Stringent Restriction from the Growth of Large-Scale Structure on Apparent Acceleration in Inhomogeneous Cosmological Models", Mustapha Ishak, Austin Peel, and M. A. Troxel. Phys. Rev. Lett. 111, 251302 (2013). 2013 Robert S. Hyer Award for Excellence in Research and Mentoring Graduate Student from the Texas Section of the American Physics Society. Jointly with Michael Troxel. Served as proposal reviewer for NASA Astronomy and Astrophysics Postdoctoral Program. Served as proposal reviewer for Research Foundation of Canada/Quebec for Natural Sciences and Technology. Served as proposal reviewer for the National Commission for Scientific and Technological Research of Chile (CONICYT Chile). Reviewed a proposal for The Foundation for Polish Science. Serving on the Editorial Board of Journal of Gravity. HPC publishing. New York. Served as Chair for the Cosmic Microwave Background session at the 2010 Annual conference of the American Astronomy Society in Washington DC. Served as Chair for the Dark Matter & Dark Energy session of the 2010 Annual conference of the American Astronomy Society in Washington DC. Served as Chair for the cosmology session of the 2012 Annual conference of the American Astronomy Society in Austin, TX. Serving as member of the Large Synoptic Survey Telescope (LSST) DESC Science Collaboration. Member of the physics faculty development committee (2010-present). Co-Chaired the local and international scientific organizing committees of the 27thTexas Symposium on Relativistic Astrophysics. (Jubilee meeting). The National Science Foundation recently awarded Dr. Mustapha Ishak-Boushaki, associate professor of physics at UT Dallas, a $222,000 research grant for his investigations of the gravitational lensing technique used to study the nature of the universe. His studies are aimed at improving the technique to more accurately measure the distribution and density of mass in the universe. His research also could contribute to a better understanding of dark matter, a type of matter thought to be about five times more prevalent than ordinary matter that can be seen through telescopes.Gravitational lensing also can be used to test cosmological models of the universe. “The NSF grant will allow our team to investigate new theoretical and numerical techniques that should help refine the signals received on Earth from deep-sky objects affected by gravitational lensing,” Ishak-Boushaki said. Cosmologist Dr. Mustapha Ishak-Boushaki received a $180,000 NASA grant to embark on a two-year study of new models to explain why our universe is picking up speed while it tears itself apart. 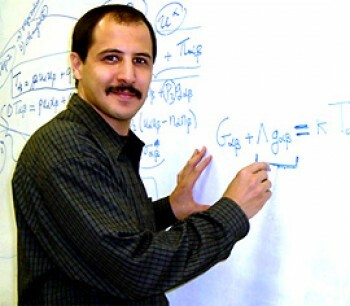 Ishak-Boushaki, an assistant professor of physics and principal investigator of the UT Dallas Astrophysics, Cosmology and Relativity Group, is using mathematical and numerical tools to explore cosmological models, called Szekeres models, which may offer a more complete explanation of cosmic acceleration than previous models. Cosmology is the branch of astrophysics concerned with the origin, evolution and structure of the universe. Widely considered the most perplexing problem to ever confront astrophysicists, the universe presents a baffling contradiction to logic: gravity should slow the expansion of the universe, not let it speed up. Astrophysicists at The University of Texas at Dallas are helping to better define the nature of the cosmos by examining why the universe appears to be expanding at an accelerating pace. In the last century, scientists developed the Big Bang model, which posits that the universe began when a single point containing all the matter in the universe exploded some 13.8 billion years ago. Since then, the universe has been expanding. In 1998, researchers observed light from exploding stars called supernovas, and found that the universe is not expanding at a constant rate, nor is it slowing down, as would be expected from the force of gravity pulling all matter together. Instead, scientists found that the expansion is speeding up. “Because we have eliminated one possibility, researchers can now focus on examining other possible theories as a cause of cosmic acceleration,” said Dr. Mustapha Ishak-Boushaki, an associate professor of physics. Eske Pederson (graduation expected in 2021). Anish Agash (graduation expected in 2023). Cristhian Garcia Quintero (graduation expected in 2024). Logan Fox (graduation expected in 2024). Tim Carlton summer 2006 Ray Whitside, summer 2007 Sid Mittal, summer 2008 Parker Maginley, summer 2008 Brandyn Lee, summer 2009 Scott Meesse, summer 2009 Genway Huang, summer 2010 Evan Remmele, summer 2011, Emily Bailey 2018, Amelia Neild 2018. Professor Mustapha Ishak-Boushaki (Group Leader), Professor Mike Kesden, Professor Lindsay King, Professor Kaloyan Penev, Professor Wolfgang Rindler (Emeritus). James Richardson (graduated in 2008). Joined the corporate sector. Jacob Moldenhaeur (graduated in 2010). Assistant Professor at University of Dallas. Anthony Nwankwo (graduated in 2011). Joined the corporate sector. Jason Dossett (graduated in 2013). Working as Research Fellow in Astrophysics at INAF -- Osservatorio Astronomico di Brera, Italy. Michael Troxel (graduated May 2014). Working as Research Associate in Astrophysics at The Ohio State University. Austin Peel (graduated in May 2015). Working as Research Associate in Astrophysics and Cosmology at the Institute of Astrophysics, CEA-Saclay, France. Tharake Wijenayake (graduated in May 2016). Quantitative Analyst at Zacks Investment Managment. Ji Yao graduated in 2018 and is working as postdoctoral research fellow at the School of Astronomy Shanghei Jiao Tong University. Weikang Lin graduated in 2018 and is working as postdoctoral research fellow at North Carolina State University.